Yo! If you’re looking for short-term chart patterns on the euro, then I’ve got your fix ‘coz I’ve got a channel on EUR/NZD and a triangle on EUR/GBP in today’s intraday charts update. 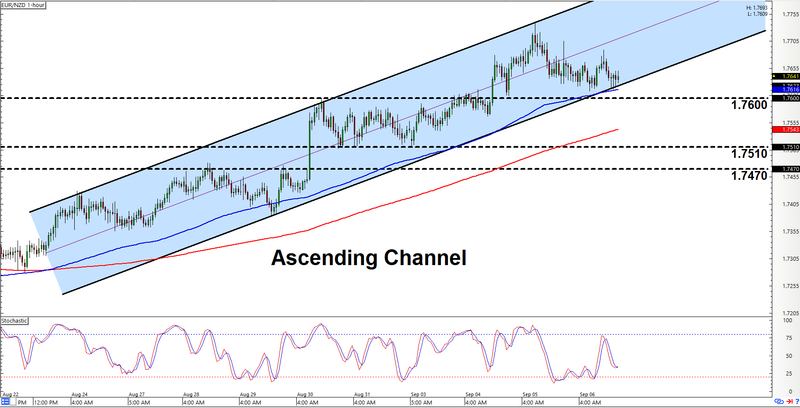 First up is that there ascending channel on EUR/NZD’s 1-hour chart that the trend playas out there may like. As y’all can see, the pair is currently testing the channel’s support. Y’all may therefore wanna start lookin’ for opportunities to go long on the pair. And all the more so, given that stochastic will soon reach oversold territory and the 100 SMA appears to be acting as dynamic support. There is a chance that the pair may temporarily break lower, though, since the closest area of interest is actually at the 1.7600 major psychological level, which is below the channel’s support. It’s all good so long as 1.7600 holds as support, however. But in the unlikely scenario that support fails, then y’all may wanna think about switching to a more bearish bias if the pair moves lower past 1.7510 and 1.7470. 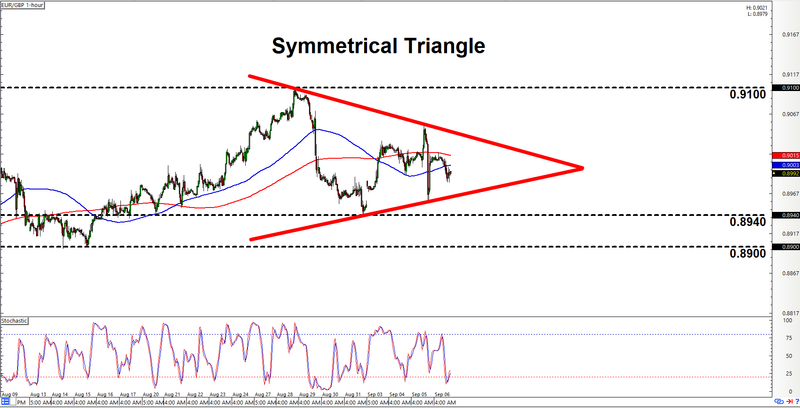 If trading breakouts is more your thing, then you may like that there symmetrical triangle on EUR/GBP’s 1-hour chart. A symmetrical triangle pattern forms when bulls and bears are battling it out, but neither side has a clear advantage. It’s only a matter of time before one side finally gives way, though. However, one side is just as likely to win as the other. As such, we don’t really have a strong directional bias on the pair. But in the event that a topside breakout does occur, then the pair should ideally clear the 0.9100 major psychological level on strong bullish momentum. Otherwise, the risk remains high that the breakout may fail and end up being a fakeout. A downside breakout, meanwhile, should smash lower past 0.8940 and then 0.8900 before the breakout move is confirmed. In any case, y’all just make sure to practice proper risk management as always, a’ight? Peace, out!